I didn't plan on making a wearable muslin, if a wearable muslin is considered one that you would actually wear out and not be embarrassed to be seen in. I absolutely hated this fabric and sloppily put my muslin together if for nothing but for the purpose figuring out the fit. I have to say this fabic has kind of grown on me. It was in a pile of fabric my hubby's grandma gave to me. When I started sewing she told me not to buy any fabric because she had plenty for me to get started with. I was grateful for what she gave me but boy was she asking alot. Not buy any fabric!?! Ha little did she know I had already had a growing stash. This was one particular piece I didn't plan on wearing so I thought it would work for a muslin. 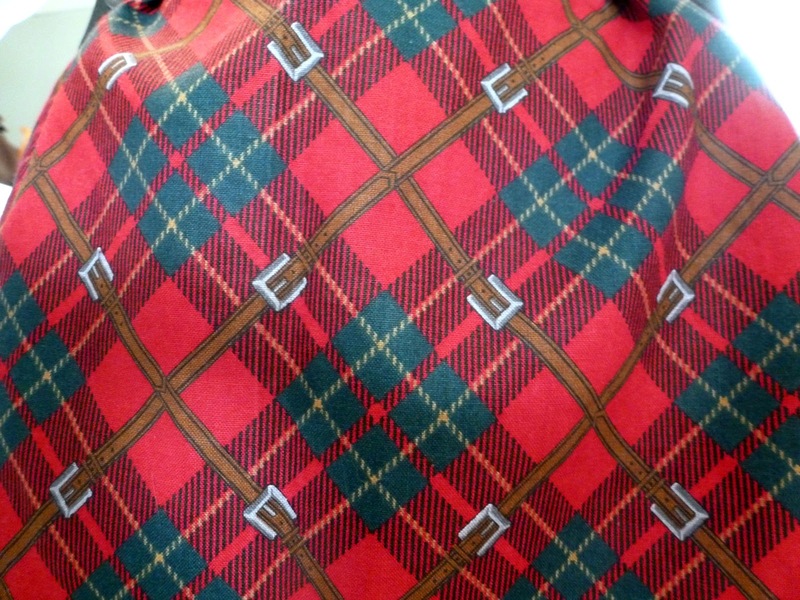 I mean look at it, take all of it's red/green tarten plaid goodness in. And don't overlook the tiny belts mixed in. Maybe I should buy me some bagpipes and rock it for Halloween. 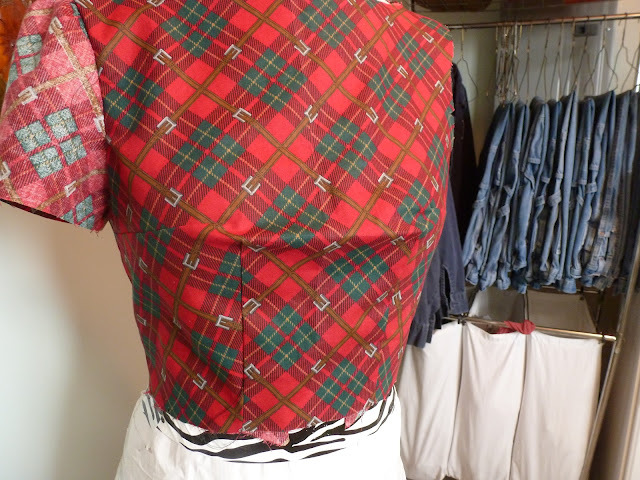 I barely had enough for the pattern, meaning some of my seams still have the selvage. I went ahead cut sleeves but I think I'm going to leave them off the final version so I can comfortably wear a cardigan with it. Yes nevermind my backward sleeve....let's focus on the akwardness going on in the boobage area. Hmm, I guess I could rock my inner Madonna (while playing my bagpipes)!? I wondered if this was just my error or if anyone else has had this problem but after alot of research and help from others I determined I wasn't the only one and decided to do what others had, move and shorten the darts. I moved each of the horizontal darts over two inches closer to the side and shortened each by one inch. I also shortened the bust darts by one inch. 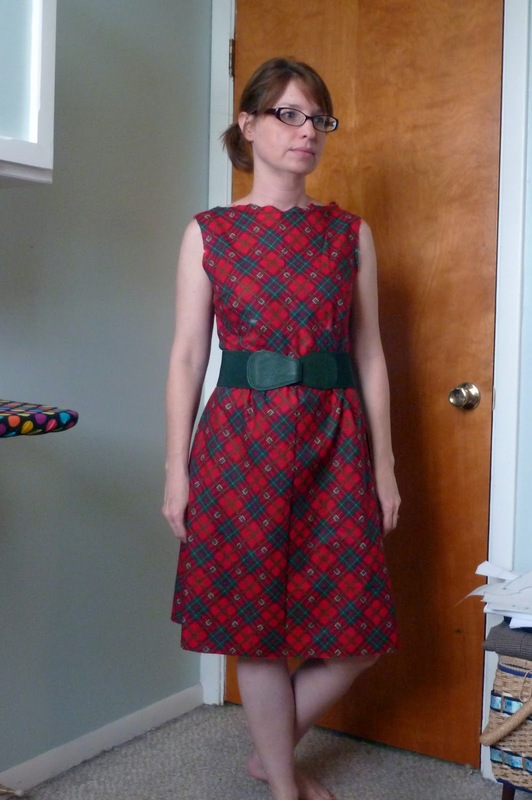 Nevermind my just rolled out of bed look and unfinished neck, sleeve and hemlines. Sloppy Sunday is what I call today. I rarely get out of my pj's and just prefer to be a slob. I thought you all might be interested in my progress and what it took to get there. After seeing myself in the dress I thought this fabric's not so bad after all. I may just finish it and actually wear it. What do you think? I got some ideas brewing in my head for the final version so stay tuned. Hope you all had a great weekend and may all your Sundays be sloppy. Hi there! I've been following you since I saw your macaron on the colette flickr group. Loved it so much. Anyhow I agree with you totally on the fabric. On its own its pretty scary but made up into the Peony it looks totally different and very wearable in public. You don't need to do much to finish it, the fit is good, I say go for it. Thank you! That Macaron is one of my favorite dresses I've made so far. Just love the kitties! I think I am going to finish this dress up. It would be a good dress to wear to a Christmas party! I agree. The first pic of the fabric is scary, but made up into a dress, it looks pretty cute. I'm loving the Peony since I finished mine yesterday (I'll get it blogged soon). I love it so much that I'm thinking I'll be making at least 2 or 3 more with the same pattern. If you end up as addicted as I, you'll be ahead of the game if you finish up this one to wear. 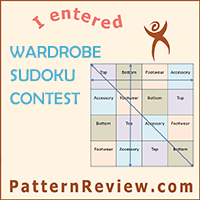 Yes I really love this pattern too! So easy to make!! Oooh the fabric looks nice as a Peony! Cool, you have a wearable muslin and it looks good! Yea I'm going to cut out the neckline a bit too. I don't like the feeling like it's choking me. Looks like prints with belt buckles are all the rage. Add some tall riding boots and you're set! ooohh those are really nice!! I love this fabric in the dress! WAy cute! And you've got your fit issues worked out really well-- great job, dude! This is looking fantastic! The fabric is super cool :) The darts have been a massive problem with this bodice and I have found shifting them works a treat. Look forward to seein the finished product!